Nito Installer developed by Kevin bradley is an easy to use and free installer that can be run on iPhone and iPod. It allows you to easily install NitoTV and XBMC (Kodi) on your Jailbroken Apple TV 2. Luckily developers has further modified the installer and is now available for Mac OS X and Windows platform making it much easier to install add-ons on your Apple TV. If you’ve been looking for a free alternative to FireCore’s aTV flash black, then Nito TV installer is one of the best alternative. The installation process is really simple but as I said earlier you need to first Jailbreak your Apple TV 2. Once done you can launch the installer to install Nito or XBMC. Both devices needs to be connected to the same Wi-Fi network. 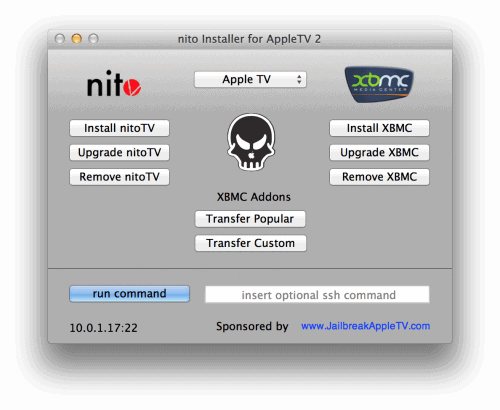 Installer makes it easier to remove nitoTV or XBMC if in case you later decide to uninstall. You can download the latest version of nito installer for Apple tv 2 using the direct download links given below.